Relatives of 27 people killed when Nato aircraft bombed a civilian convoy in southern Afghanistan have demanded that foreign forces leave the country. Afghan officials said that at least four women and a child were among the dead. Twelve other civilians were wounded when three minibuses were attacked on Sunday in a remote part of Uruzgan province. The local governor and the Interior Minister said that all of the victims were civilians. Nato commanders said that their new strategy was focused on protecting the population — but the airstrike capped a week in which more than 60 civilians were killed by Nato weapons. The Afghan Cabinet called the attack “unjustifiable”. The convoy was travelling from Day Kundi to Kandahar when Nato and Afghan forces targeted it. Nato’s International Security Assistance Force (Isaf) said that troops on the ground thought the civilians were militants “en route to attack a joint Afghan-Isaf unit”, but later confirmed that there were women and children at the scene. Isaf refused to say how the airstrike was authorised, “to avoid prejudicing the investigation”. Dutch and Australian troops are based in Uruzgan alongside US Special Forces. The Netherlands is expected to withdraw its forces by the end of this year after the collapse of the Dutch Government. Mr Rasoul, who spoke to The Times from Tirin Kowt, the capital of Uruzgan, said that his dead cousins, Nasim and Aminullah, had young children. “Who will feed them now?” he said. Day Kundi is one of the poorest Afghan provinces. An elder from Char Chino district in Uruzgan said that most of the victims were travelling to Kandahar to find work. Nato acknowledged that it has previously relied on shoddy intelligence and called in airstrikes when there was no immediate need. President Karzai repeated calls on Saturday for the coalition to prevent civilian casualties. On Sunday at least nine were killed when troops in Helmand hit a compound during Operation Moshtarak. Afghan rights groups said that at least 19 civilians have been killed in the offensive. Refugees said that the figure was higher. On Monday last week Nato and Afghan forces mistakenly killed five men and injured two others in Kandahar province. 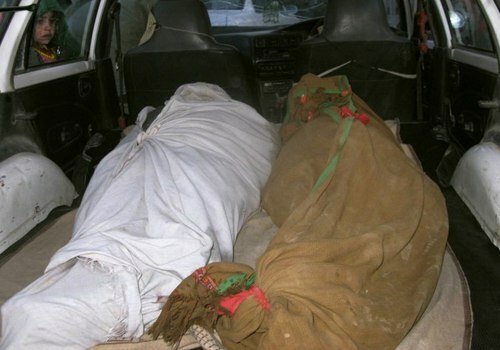 On Thursday an airstrike in Kunduz province killed seven policemen. The next day a man was shot and killed in Nad-e Ali. Last month four Afghan soldiers at a checkpoint in Wardak were killed after American troops called in an airstrike. In December Nato was accused of killing ten civilians, including eight schoolchildren, in Narang district in Kunar. Nato said that they were part of a bomb-making cell. A recent UN report found that 1.8 million people need assistance for the condition (malnutrition), including at least 1.3 million children under the age of five.